Watch Mitt Romney on American Morning. McCain, who has focused his campaign on his national security and foreign policy credentials, has faced charges that he is relatively inexperienced dealing with economic policy. 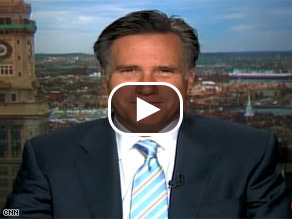 Romney defended the presumptive GOP nominee’s record on CNN’s American Morning Tuesday. Romney’s own fiscal expertise was a foundation of his own White House bid. He has been named as a possible running mate for McCain, but has refused to speculate on his vice presidential chances . “I’m working real hard to get Sen. McCain elected. He’s got a number of people that he can choose from,” Romney told Chetry Tuesday. McCain himself has admitted he knows nothing about the economy. His proposals today encouraging the U.S. to stop purchasing oil for reserves to bring the price down supports that view. I've been hearing for weeks that the shortages of our reserves are responsible for prices going up. McCain's suggestion also puts a question mark on his national security expertise, which would otherwise appear to be his strongpoint. Less reserves means more dependence on Middle Eastern suppliers who are less than friends to the U.S. and who also fund and harbor terrorist organizations and operatives in Iraq and Afghanistan as well as Lebanon and Pakistan - extending and complicating the wars in those places. So the sharks are out, and the funny thing is the media is helping them. Obama will still win, and it won't be pretty, but the American people are not going to fall for this stupid argument. We know McGoo has nothing to offer but more war, more pain, more suffering. He’s good about trying to tell us that everything is fine, now let’s get back to the war. He is a zero, and nobody’s paying attention to him, because he will lose big in November. So you can bring out the Romneys and the Huckabeasts, and the Hillaries, we don't care. Obama will win. This plastic Romney is a zero, and his campaign was proof of that. If the GOP thinks it's got a winner, think again. They don't. The only winners will be the American soldiers when Barack brings them home. Shame on you Rommey! Mc Cain can't even read – give me a break! The guy who ran the most negative attacks on the Republican side (especially against McCain) is now vying to be McCain's VP candidate. How funny! The only reason Mitt Romney is backing McCain is because he knows that anyone who is McCain's VP pick will have a clear field to run for President in 2012 should by some nightmare McCain is elected President. My God, they call Obama an elitist, a guy who did so much work for the comunity, what the heck did McCain actually do for his gated comunity (or 8 gated comunities). But Obama is the arrogant one? ...and don't get me started on Hillary, the wretched woman would sell Bill, Chelsea and her mother to China for the Presidency. Now Romney is flapping his flip-flopping lips on the economy?. Mitt has proven time and time again that he will say and do (or buy)whatever he thinks is necessary to promote his own agenda......NOT that of the American people. It didn't work in his bid for the presidency and it won't work in his bid for the V.P. spot. This man is as disingenuous as they come and would absolutely end any shot Sen. McCain has of reaching the White House. OMG, Ken is back, where is Barbie? Nightmare–let me wake up from this GOP,or in my book (Greedy Old People), dream. They wouldn't know how to fix America's problems if their lives depended on it. And since their lives don't (because they are gazillionaires), they won't care about our problems. War, power, war, power, war, power....we've heard this record before and America is not buying it. Mike, are you really that ignorant? If this Mr. McGoo II wants to be the VP, so be it. He couldn't buy the primaries, and he won't help McGoo buy the general. America has had enough of the gazillionaires looking their noses down on us, while watching our men and women sacrifice so their kids can have the easy life. Enough. Hey Rom, when are you sending your boys over for the Bush/McGoo war? Never, I thought so. I've had enough of this political Kool-aid. I'm not drinking it, and neither is the American people. Enough is enough. Take your trust funds, and your caviar, and go back to your eight homes and your yachts. We don’t' need you. There's a war going on that needs to be stopped. That will help our economy. just like the Italians, who for the love of it WHY? put a guy back in charge after they ousted him four years ago, yes, a media mogul who bought two previous elections. "A person is smart, people are dumb, panicky things". Oh my gosh here we go again.. Your 15 min of fame is up and there is no help for McCain as it would be a nightmare if he actually wins the pesidency. Don't be fooled by liars, all that glitters is not gold. Hillary will try to steal this election for Hillary and nothing will happen. She is a train wreck waiting to happen and I'm not going to look. I'm going to vote for real change and a real chance to bring our soldiers home. That change and that chance is Barack Obama. Romney will say anything to get the VP! I stll haven't forgot things you said about MCSAME economic cridentials !